In Africa, the big five game animals are the lion, leopard, rhinoceros, elephant, and Cape buffalo. The term "big five game" (usually capitalized or quoted as "Big Five") was coined by big-game hunters and refers to the five most difficult animals in Africa to hunt on foot. Subsequently the term was adopted by safari tour operators for marketing purposes. The members of the Big Five were chosen for the difficulty in hunting them and the degree of danger involved, rather than their size. The big five are among the most dangerous, yet most popular species for big-game hunters to hunt. The 1990 and later releases of South African rand banknotes feature a different big-five animal on each denomination. Countries where all the members of the big five can be found include Angola, Botswana, Zambia, Uganda, Namibia, Ethiopia, South Africa, Kenya, Tanzania, Zimbabwe, the Democratic Republic of the Congo, Rwanda and Malawi. The African elephant is a very large herbivore having thick, almost hairless skin, a long, flexible, prehensile trunk, upper incisors forming long curved tusks of ivory, and large, fan-shaped ears. The two distinct species of African elephant are: African forest elephant and the African bush elephant. It is said that elephants are difficult to hunt because, despite their large size, they are able to hide in tall grass and are more likely to charge than the other species. The black rhinoceros is a large herbivore having two upright horns on the nasal bridge. Its thick (1.5–5 cm) protective skin, formed from layers of collagen positioned in a lattice structure, is very hard to puncture. 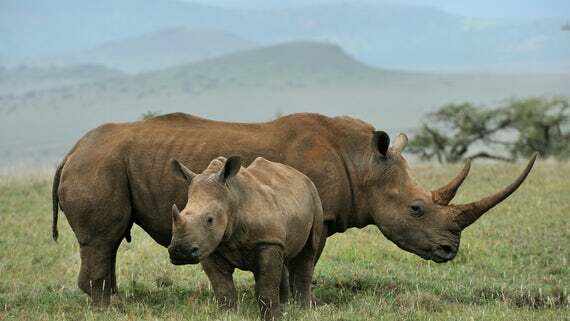 In the context of big-game hunting in Africa, the term "rhinoceros" may refer to either the black or the white rhinoceros, in South Africa they are called ‘Rhino’. Among big five game hunters, the black rhinoceros is preferred, although it is now critically endangered, and hunting is extremely limited due to this. The African buffalo or Cape buffalo is a large horned bovid. Buffalo are sometimes reported to have killed more hunters in Africa than any other animal, and they're the only animals within the Big Five that aren't endangered or threatened. A similar claim is also made of hippos and crocodiles, but these statements include all people and not strictly hunters. The Cape buffalo is considered by many to be the most dangerous of the big five, reportedly causing the most hunter deaths, with wounded animals reported to ambush and attack pursuers. The lion is a large carnivorous feline of Africa and northwest India, having a short, tawny coat, a tufted tail, and in the male, a heavy mane around the neck and shoulders. Lions are desirable to hunters because of the very real danger involved. A lion may attack without provocation, and is considered by many to be the best of the big five. Lion hunting is challenging because of the habitat and temperament of the lion. Lions live in the savanna where tall grasses, shrubs, and bushes obscure them and provide cover and camouflage. Lions do not generally avoid confrontation, but will usually face a challenger. They are unpredictable and may charge when sufficiently annoyed or confronted by danger. These factors together make lion hunting a challenge to hunters. The leopard is a large, carnivorous feline having either tawny fur with dark rosette-like markings or black fur. Of the big five, it is most difficult to acquire hunting licenses for leopards. The leopard is considered the most difficult of the big five to hunt because of their nocturnal and secretive nature. They are wary of humans and will take flight in the face of danger. The leopard is solitary by nature, and is most active between sunset and sunrise, although it may hunt during the day in some areas. Leopards can be found in the savanna grasslands, brush land and forested areas in Africa. Baiting, hounding, and stalking are the most common methods used to hunt the cat. Pretoria is a city in the northern part of Gauteng province in South Africa. It straddles the Apies River and has spread eastwards into the foothills of the Magaliesberg mountains. It is one of the country's three capital cities, serving as the seat of the administrative branch of government while Cape Town is the legislative capital and Bloemfontein the judicial capital. There have been proposals to change the name of Pretoria itself to Tshwane, and the proposed name change has caused some controversy. Pretoria is named after the Voortrekker leader Andries Pretorius, and within South Africa is popularly known as the "Jacaranda City" due to the approximately 50 000 Jacarandas that line its streets, parks and gardens. Being an invasive species, jacaranda trees are no longer allowed to be planted in Pretoria. The South Africa’s capital city is situated approximately 55 km (34 mi) north-northeast of Johannesburg in the northeast of South Africa, in a transitional belt between the plateau of the Highveld to the south and the lower-lying Bushveld to the north. The Jacaranda City as Pretoria is known for all the purple blossom-bedecked trees, which line its thoroughfares, Pretoria is a lovely, quiet city. It has a long, involved and fascinating history. Here you will find significant old buildings and fascinating museums. The Transvaal Museum has natural history displays and is the home of Mrs Ples, the australopithecine fossil found at Sterkfontein in the Cradle of Humankind. Pretoria has been left to shrug off its former association with the apartheid government in a relative state of slumber, lying as it does in a warm, sheltered valley surrounded by the hills of the Magaliesberg range that ensure that temperatures here are invariably a few degrees warmer than the neighbouring Johannesburg. Don’t let the sleepy nature of the pretty city lull you into a false perception. Pretoria has a beauty all of its own, and the slow pace of life is regarded as a bonus by its residents. Many Jo’burgers seek a quieter existence in Pretoria, prepared to commute daily rather live in the comparative rat race. Wall flower the city is not. When in full bloom in October, Pretoria literally comes alive with blossoms and leaves no one in doubt as to the origin of its nickname - Jacaranda city. Practically mandatory when visiting the city are the Pretoria Botanical Gardens, the Zoo, the Union Buildings and various museums and galleries that include Melrose House, the Pioneer Museum, Sammy Marks museum, and the Voortrekker Monument. Outdoor activities include the Wonderboom and Groenkloof Nature Reserves, the Austin Roberts Bird Sanctuary, and a steam train ride around Pretoria. Also, worth visiting are the Cultural History Museum and Smuts Museum in Irene, outside Pretoria.